Zotac introduced the A75-ITX WiFi, a new Mini-ITX motherboard based on AMD's A75 chipset. 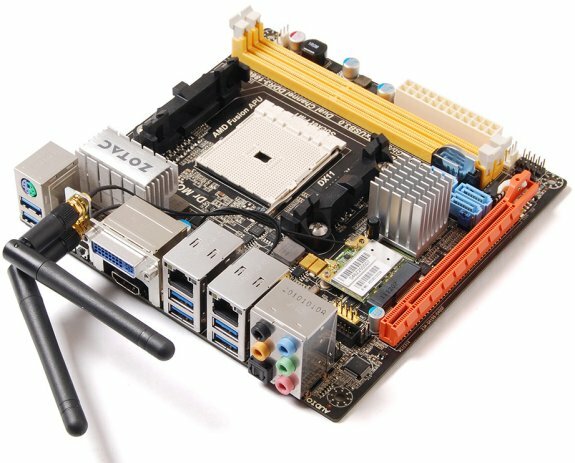 ZOTAC® International, a leading innovator and the world’s largest channel manufacturer of graphics cards, motherboards and mini-PCs, today announces the A75-ITX WiFi platform that enable users to embrace the power of AMD accelerated processing units, or APUs, in a compact mini-ITX form factor to form the perfect gaming capable home theatre PC. The ZOTAC® A75-ITX WiFi features an FM1 socket to take advantage of the latest AMD A8, A6, A4 and E2 series APUs with AMD Radeon™ HD 6000 series graphics processors for the perfect synergy of CPU and GPU performance power. Two memory slots enable users to install up to 8GB of high-speed DDR3 memory with speeds up to 1866 MHz, depending on the APU installed, for maximum system responsiveness for media playback, gaming and every-day use. “Our goal at ZOTAC® is to pack as many features and capabilities into the smallest form factory possible. The ZOTAC® A75-ITX WiFi is no different – we’ve packed it with features and expansion capabilities typical of larger ATX offerings,” said Carsten Berger, marketing director, ZOTAC International. There is plenty of expansion with the ZOTAC® A75-ITX WiFi, including a PCI Express x16 slot, up to eight USB 3.0 and four SATA 6.0 Gb/s ports, for maximum internal and external upgrade potential from a compact form factor. Dual Gigabit Ethernet, 802.11n WiFi and Bluetooth 3.0 networking technologies enable the ZOTAC® A75-ITX WiFi to deliver lightning-fast network transfers over wires or wireless and easily connect to wireless peripherals and phones. It’s time to play with the ZOTAC® A75-ITX WiFi mini-ITX platform.